A new analysis by scientists at the U.S. Environmental Protection Agency suggests there could be risks to area residents if an underground fire were to reach radioactive waste at the West Lake Landfill. This radiation warning sign is posted on the perimeter fence of the West Lake Landfill in Bridgeton, Mo. An underground fire has been smoldering at the adjacent Bridgeton Landfill for more than three years and is now about 900 to 1,000 feet from the radioactive material. At the request of EPA Region 7 officials in Kansas City, EPA scientists in Cincinnati reviewed a report prepared by a contractor that was hired by Bridgeton Landfill owner, Republic Services, and the other “potentially responsible parties” (PRPs) at the West Lake Superfund Site. Their Jan. 14 report, by Engineering Management Support, Inc. (EMSI), evaluated what would happen if the underground fire at Bridgeton were to reach the radioactive material at West Lake or if a new “subsurface smoldering event” (SSE) were to develop in the radioactive area. The EPA agrees that the heat will not make the waste more or less radioactive, or cause it to explode. But since no one knows what else is mixed in with the radioactive waste, a subsurface fire could potentially react with those unknown substances, causing an explosion. In 2008, EPA Region 7 issued its Record of Decision (ROD) for the West Lake Landfill, saying it planned to leave the radioactive waste in place and cover the landfill with a “cap” of rock, clay and soil (that decision is currently under review). The new analysis by EPA scientists says that if an underground flame-less fire were to reach high enough temperatures, it could crack open that cap. That, in turn, could let radon gas, steam, and radioactive dust escape from the landfill into the air. A subsurface fire in the radioactive waste would cause pressure to build up in the West Lake Landfill, forcing out radon and other gases. If the landfill is capped and the cap cracks (see previous bullet point), unhealthy levels of radon could escape into the air. These toxic emissions could continue for a long time before anybody notices them, if the cap is only inspected once a year. Certain weather conditions could allow radon and other toxic gases to build up to even higher levels in the air around the landfill. If there were an underground fire in the radioactive waste, people in the area could be exposed to unhealthy levels of radon gas. In addition, more liquid would build up inside the landfill, which could carry radon gas, radioactive waste, and other contaminants into groundwater and out of the landfill that way. Maryland Heights resident Dawn Chapman sees the new EPA analysis as a turning point that opens the door to a better working relationship between the federal agency and the local community. "We need to stop talking about the 2008 capping of West Lake Landfill,” Chapman said. “We need to start talking about other types of long-term solutions to protect this neighborhood and the environment from these radiological wastes." "We appreciate the agency’s review and look forward to working with EPA to address any comments and allow the evaluation to be finalized and included in the record. This draft of the evaluation should temper some of the wildest speculations about the site. Based upon current data, EPA does not expect the SSE to come into contact with the RIM. EPA’s experts agree the RIM is not expected to be more or less radioactive in the presence of heat and that there’s no evidence the RIM will become explosive in the presence of heat." The new EPA analysis explicitly states that agency scientists did not assess the likelihood of the subsurface fire at the Bridgeton Landfill reaching the radioactive waste, or the chances of a similar fire starting on its own at West Lake. You can find more EPA reports and other documents related to the West Lake Landfill here. 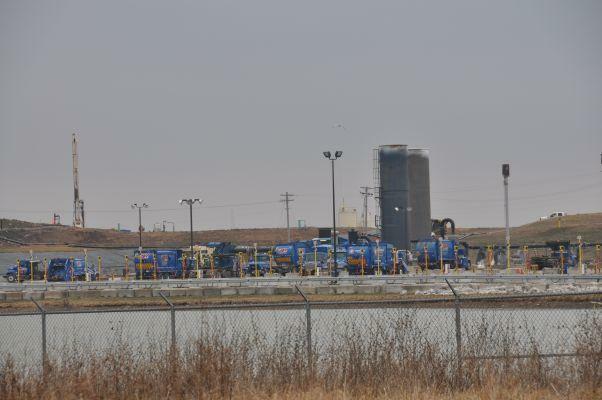 There is increasing concern about the status of two landfills in Bridgeton as a slow-moving underground fire in the Bridgeton Landfill edges towards the adjacent West Lake Landfill. Radioactive waste left over from World War II was illegally dumped at West Lake in the 1970s. A study conducted for the U.S. Environmental Protection Agency has concluded that the underground fire plaguing part of the Bridgeton Landfill site isn’t a hazardous threat, even if it reaches radioactive material stored at a neighboring landfill.